Martin Clark is Exhibitions Director at Tate St Ives. Interview Rupert White. You've been here for just over two years and there have been some great shows during that time which is credit to you and your team here. You were at Arnolfini in Bristol before coming to St Ives. In which ways was working in Bristol different? The first and most obvious difference is that Arnolfini doesn't have a collection, whereas Tate St Ives (picture below right) is able to draw on the Tate collection. I'd never worked with a collection before. My background is working with contemporary international artists and so I wanted to bring that experience to bear at Tate St Ives, but the challenge was how to also look at the Tate collection as a whole and the specifics of what it means in St Ives and see whether I could do something that brought those two elements together. Its also a very different audience as well. Arnolfini is a large metropolitan centre. There are a lot of students, lots of industry and it's an urban centre. Arnolfini was also free. People could just walk in and walk out. For Tate St Ives you've got to buy a ticket and you've got to decide to come here. And the Tate brand is a whole other thing as well. One of the really exciting things was first when I discovered how many people come here 240,000 a year is pretty extraordinary for any regional art gallery. Within that are a very high proportion of first time gallery goers: people who have never been to an gallery of modern before. You've just come back from Frieze, and I would guess one of the challenges for you is keeping in touch with developments in art elsewhere outside of Cornwall.. It means I travel a lot. I 'm based in St Ives. I live in St Ives. I'm here the majority of my time but I go up to London at least once every two weeks for a couple of days, and on top of that I travel around the country and internationally either to see artists, or work, or for meetings. Travelling from St Ives presents its own challenges. It adds a day onto any journey. Was that part of the argument for splitting the role of exhibitions director and executive director; Mark Osterfield's role? Its difficult to get one person who is able to combine all of the skills and roles. And its a massive luxury having Mark Osterfield, the Executive Director, able to share and lead on a lot of the organisational aspects of the work. It does mean I'm able to focus on the programme. And I think that has shown in the last two years. It's allowed us to push the programme as far as we have. Where were you before Arnolfini? Kent Institute of Art and Design. I was the curator for their three gallery spaces on three campuses. I was there for three years, and teaching across various BA and MA courses. Are you an art historian by training? No. An art practitioner. I studied Fine Art at Sheffield Hallam. Then stayed up in Sheffield and worked with a studio group called S1 and began organising exhibitions with my peers. That's how I became interested in exhibition making. I didn't know that about you. Maybe that explains your interest in contemporary art. One of the things that you notice about artists is that they take an interest in the art of the past but are more involved in the art of now. Curators have traditionally come from an art history background but more often now are coming from an art practice background, and you can really see a difference in approach. For me it is about getting as close as you can to the artist's practice and understanding that practice from a very personal point of view, the point of view of an interested audience, a viewer, not necessarily an academic or an historian. I did go on to do the curatorial MA at the Royal College. So I did have that formal training. Though I did it as an artist. It became more blurred for me. I came out being more interested in other artists than in my own work. Have particular artists been important to you in the past? I don't know if you would recognise this but, thinking of that point in the 60s when art changed, when there seemed to be a kind of paradigm shift: personally it was Bruce Nauman who most helped me make the leap and helped me understand conceptual art for example. It was exactly that. At A-level I remember being interested in German Expressionism by way of Van Gogh, then got to my foundation and found out about conceptual art practices of the 60s: Fluxus, Mail Art, that whole dematerialisation of the art object. That was an important moment for me. Yes. My practice became very conceptual. But from that I've returned to material practices. 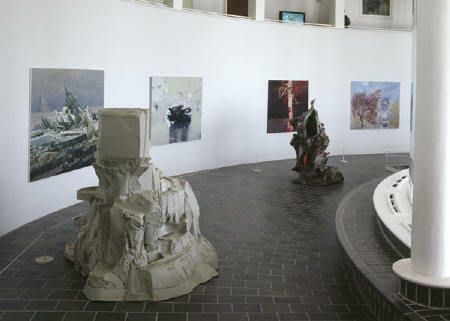 Sculpture and painting. I'm less interested now in conceptual practices in contemporary art but they are still fundamentally important. Is that something about being in St Ives? Maybe it allows you to make links with the 20th Century modernists more easily. I think as a curator you have to follow practice as it develops, and at the moment it seems like the most interesting contemporary art is engaged with these material processes. You try and follow the artists and understand what that means. Sometimes I'm looking at work and I think 'I don't know how to approach this work'. I remember the first time I saw Martin Kippenberger's work (picture above right) as a student 15 odd years ago, I thought 'I don't know how to look at this' but actually I kept coming back to it, and it's that difficulty and lack of recognition initially that normally provides the richest most long term experience. Kippenberger has a diverse practice and maybe that's part of it as well. There's something rewarding about diversity in an artist's work. Coming to The Dark Monarch, you spoke to me about it more than a year ago. Its been a long time in gestation. Has the concept changed much? It started off as an idea linked to coming here. Being here. I wouldn't have done this show had I been at the Arnolfini. Having said that there are aspects of this show that are absolutely pertinent to what contemporary artists are doing now and what they are looking at in terms of their historical references. 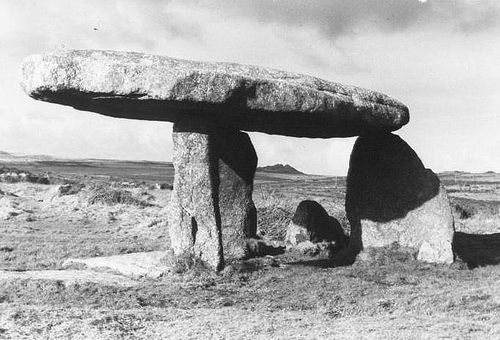 It came out of thinking about the geographic location here in West Penwith. Thinking about the cliche: the quality of light etc. I was interested in the flip side of this. 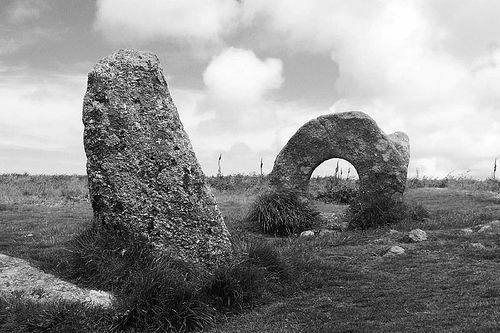 The darker aspects of this landscape, both physically and historically, in terms of the history, the prehistoric monuments that litter Penwith (B&W pictures above x2), the legends, the folklore, the history of Methodism. Cornwall is a tough place. I wanted to make a show that explored those aspects and the influence they had on artists we think we already know. It's easy with some of the artists, like Bryan Wynter, he's very obviously influenced by those aspects of the landscape. Absolutely. His early work was very much bound up with mythologising the landscape. And it continued through his career. Some of the other artist in the show are less well known: Fay Pomerance, Hubert Dalwood, Penny Slinger. Can you say a bit about them? You begin thinking about the exhibition, making lists of artists and what it might look like. Artists come in and drop off at different points throughout the development of the show. I worked with two co-curators Michael Bracewell and Alun Rowlands who also brought their own artists to the table. We had lots of discussions about who was in the show. It wasn't just about who we liked and who we thought was good, it was about what particular artists did through their inclusion and where they took the narrative of the show. So it has been pretty rigorous and that's been to the benefit of the show. Along the course of the research a few artists were thown up that were much less well known. Hubert Dalwood (picture above: Lucca (1958)) I knew about through being in St Ives. He is a peripheral figure in the St Ives story, he came down here for a little while, I think he worked with Barbara Hepworth for a while, then went away again. 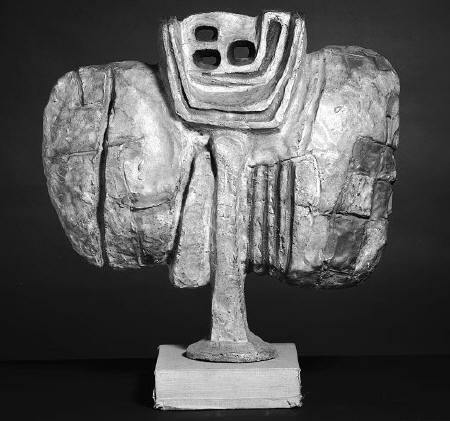 There are a couple of works in the Tate collection, but he's a very marginalised, overlooked sculptor. Work made in the 60s? Late fifties, early sixties. He's got a big show at the New Art Centre at the moment. But Fay Pomerance is an interesting one. She was an artist that none of us had come across before. When we were trying to trace one of the works in the exhibition, 'Skull Vision' by Michael Ayrton, we found out that the owner was a woman called Jill Pomerance who had acquired the painting from her mother who owned it originally. Jill was fantastic and wrote us lots of information about the painting, and also mentioned that her mother was an artist who had been a great friend of Michael Ayrton, and they'd had a lot of correspondence over the years. I was interested in this and she offered to send me images of her mother's work and I was astonished by this work and in particular the work in this show the 'Sphere of Redemption' which is an extraordinary object. It is the last part of a sequence of panels which depict the fall and rise of the angel Lucifer which was her great theme, her life's work. 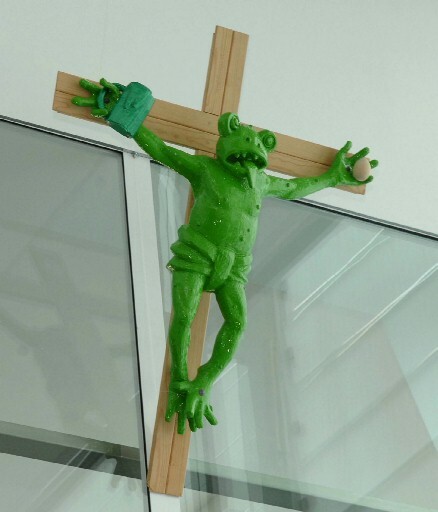 Everything was leading up to this depiction of this great judeo-christian myth. Is that in a private collection? Its in the University of Durham. Hope they're looking after it.. The students are very fond of it. Normally she sees it in a space where people have parties and drinks. 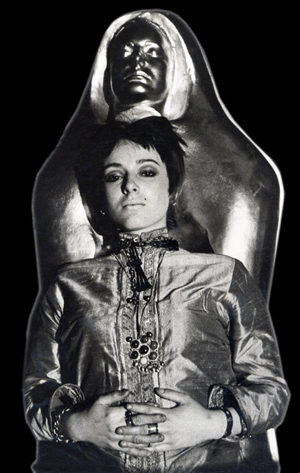 Penny Slinger (picture below: Portrait with Mummy) we came across though Linder. Linder flagged up to us that she had this book called '50% invisible woman' that she'd been given a number of years ago. Penny, who was active in the UK in the 60's and 70's moved out of Britain and went to America and again had been largely forgotten but had been supported in her early career by Roland Penrose who was a great patron of the arts and Surrealism. We managed to contact Penny and saw some of this work which again is really incredible. She's got a good website. 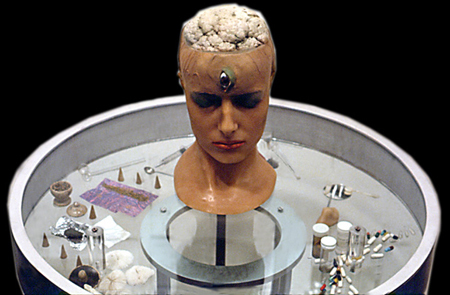 Some of the sculptural work is amazing (picture above: Blow Your Mind (1973). Reminiscent of Paul Thek. Yes, absolutely. He's a big artist for me. We wanted to bring over a work which was a mummified hawk which is very Paul Thek. But we found out about Penny literally 6 weeks before the exhibition opened so it was a bridge too far. She came out of that punk moment. Her work was always involved with feminism. She's been making work for nearly 30 years. And the link with the show is via Surrealism? The work in the late 70s came out of punk and feminism, collaging women from pin-up magazines with domestic appliances but more recently over the last 10 or so years she's been exploring more esoteric territory. She does performances as well exploring Eastern mysticism, she's been working with the ideas developed by Scriabin...the Mystic Chord. Its sounds like she's gone on a similar journey to someone like Genesis P Orridge who's went from a punk or post-punk context but has become more interested in magical and esoteric ideas as his career has gone on. Genesis, Throbbing Gristle, Psychic TV they're bubbling under the surface of the show and there's an interview in the catalogue with him. 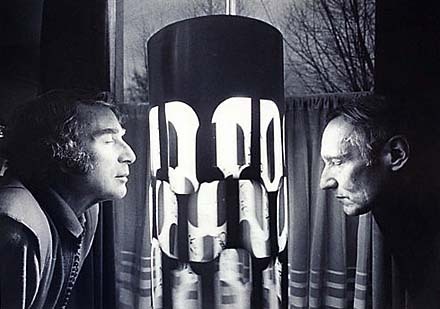 It's important because Genesis was very influenced by Brion Gysin and William Burroughs, and even though we think of them as coming out of a Beat moment, Gysin and Burroughs' work is very magical. Magic isn't just about work that looks esoteric or arcane, using magical symbols or iconography, it's to do with an approach to the nature of reality. Even Genesis' earliest work with COUM Transmissions and Throbbing Gristle (pictures below right X2) was about altering perception. Latham's work is seen as being quite scientific. He developed over many years complex theories of the way that the universe is structured, to do with duration and event, and he would produce these impenetrable equations and diagrams. It was, and he also collaborated with parapsychologists and the Society for Psychical Research, drawing in particular on a theory developed by Anita Kohsen and Clive Gregory called 'O Structure'. And then there was that thing of the materiality of his work. He uses books in his work as a raw material, they represent knowledge and thought, faulty western knowledge and dogma, and authority. How many of the artists are actually magical practitioners? Apart from Ithell Colquhoun or Austin Osman Spare who we know were. Is it possible to say? It depends how you define magic. In terms of belonging to magical societies or practicing occult ceremonies or rituals I don't think anybody else is. With the historical artists it's a bit of a grey area. We know that Michael Ayrton was interested in Aleister Crowley's writing, we know that Derek Jarman was interested in Crowley to a point but then very publically rejected it. There's a great quote about him being more interested in the magic of Duchamp than Crowley. But there are certain artists that produce work that operates in ways that might be called magical. Artists evolve their own systems of thinking, and their own ritual processes, its almost the same thing. I'm interested in that area, the piece that Jeremy Millar has made which references a Sol Lewitt structure really brings it to the fore. Conceptual art practices are so much to do with fetish, ritualisation, and with producing the conditions for an object to be transformed through the way that we look at it. And all of that has a relationship with magical thinking and practice. Returning to thinking about the process of putting on exhibitions in more general terms, to what extent do you think shows here should be receptive or responsive to location? Is it important for Tate St Ives to have its own character? Yes and no. With the programme we do three seasons a year. There are so many different ways of responding to the location. Its not just the geographic location, it's a building that's very specific architecturally and historically and its a very specific location if you think of the reasons why the Tate is here. So there is all sorts to draw on. That can be both very rich but also, if you are not careful, there is a danger it can become reductive. Sometimes its absolutely appropriate to address one or other or a group of those things. So Heimo Zobernig for instance very much addressed the architecture and the legacy of the St Ives school in an international context. This show addresses the narratives of Cornwall and Britain. But then the next show is a show of paintings by Dexter Dalwood that has very little to do with Cornwall or this building necessarily, but we have to be in a position where we feel confident enough about the programme that actually we can show anybody here because we think their work is strong and we think our audience will respond to it. Even Dexter's show will be located, because it will be about developing the language of painting that people are used to seeing down here. 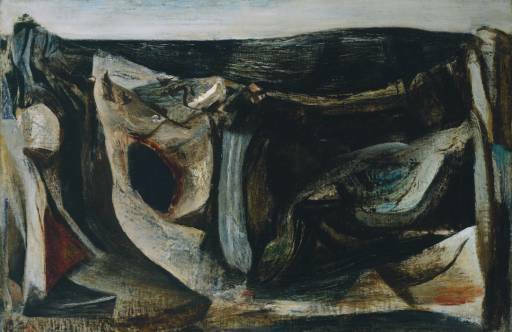 Dexter's is a post-pop figurative work rather than modernist abstraction which is what St Ives is known for. Another way of approaching this is in terms of the increasing internationalism in art. The Altermodernism show at Tate Britain, for example, was keen to emphasise the idea that we live in the same big global culture. What's your take on this issue? There's no doubt that the world has become a more connected place in the last 15 years. Cheap air travel, the internet etc. You can't pretend that's not the case. But St Ives was extraordinarily international and well connected 60 odd years ago. What was so ambitious and radical and important about the artists that were down here was not that they rejected the local and the place they were in, it was about saying 'we are here and we've got connections with Paris and New York and artists all over the world'. It was that international exchange that drove the kind of ambition. That's a problem for many artists in the region now as there aren't those international links any more to the same extent. That's one of the things were really wanting to turn our attention to at Tate St Ives. I've been here for two years now with Mark. These first two years have been about positioning the programme locally, nationally and internationally. And that's not just the contemporary programme its also the collection displays. Its about repositioning the St Ives story internationally. There is already some good work going on with people like Western Alliance and the Assembly in St Just. We want to build on those international opportunities both for artists to come here and for artists based in Cornwall to go elsewhere. How does that affect the existing residency programme? What's the situation with that at the moment? The residency has been running for about five years in its current form. That came to an end with Luke Frost. He was the last resident to be Arts Council funded in that way. We're going to spend a year looking at national and international models of residency programmes. Do some R and D work. Think about what might work in St Ives, think about how we might fund that. Put together a business model and I'm hoping in 18 months time well be able to roll out a new programme that will be much more ambitious. Much more highly developed. So we'd be looking at a cluster of residencies of varying lengths. It would be open to international practitioners. Alongside artists we could be bringing in critics, curators, art historians, researchers, filmmakers and it would n't be outcome driven. So you would n't have this idea that you have the residency, then the show and a book. 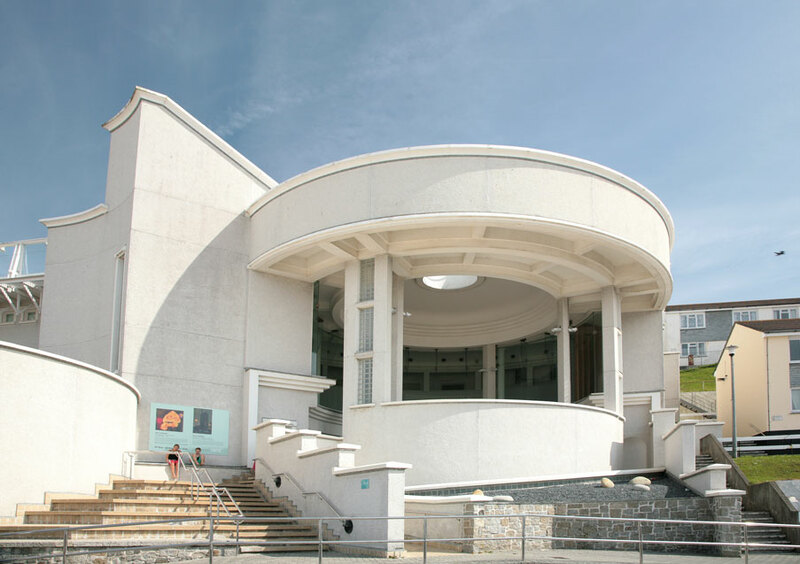 Instead it would be about creating a dynamic cluster of practitioners in St Ives who interact with the local communities through talks, events, social evenings and more formal programming running alongside the exhibitions at the gallery. Talking of regional and local artists and their relationship with the Tate, have you ruled out another Art Now Cornwall-type show in the near future? I came in just after Art Now Cornwall and I've heard a lot about the show. It tried to address issues that people wanted to be addressed. It was an inevitably difficult show to do. Even if you do an Open there still has to be a selection process and people are selected or they're not selected, and some people feel they should be in but aren't, and others are in and are not happy with it. The short answer is that there are no plans to do anything that looks like Art Now Cornwall in the galleries but there are plans to engage with the art community in Cornwall in a much deeper and richer way, hopefully through the development of the research and residency centre which will run parallel to the public programmes at Tate St Ives.